﻿Did you know that George Orwell's real name was Eric Blair? I didn't until I read it in the copy of 1984 I checked out at our local library. An Englishman, he was a political writer who "hated totalitarianism" and was very concerned about the advance of Communism and other cruelties throughout the world. 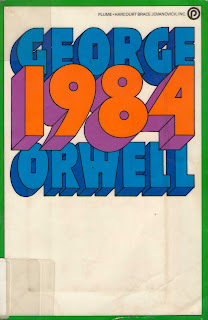 Published in 1949, the futuristic novel 1984 was written as a warning. Despite the fact that 1984 is well behind us, this novel—which has become a classic—is still relevant today. Protagonist Winston Smith is employed by the Party and always under surveillance by a "telescreen" at work and at home. It shouts out daily propaganda that can't be switched off, and is always transmitting his actions back to "Big Brother is Watching." Hate and war are constants in his life and that of others. Yet, he begins to question whether it has to be this way. In rebellion, he and a co-worker strike up a relationship and risk their lives to sneak away to be together. She, too, has come to believe that Big Brother is evil and not the way people should be required to live. You may already know the story, as I did, and that they are found out and "converted" over many years of cruel tortures. But, the real story is in the details ... how and why civilization was converted into hate and war, worshiping no religion except "Big Brother." Amazingly, today some of Big Brother's "doublethink" has invaded our society. The most obvious is that babies before birth aren't really babies, only blobs of tissue that don't feel pain. They do, by the way. That is a perfect example of 1984's "doublethink" where two plus two can equal five and the slogans "War is Peace," or "Freedom is Slavery," and "Ignorance is Strength" are promoted as true. In our own time, terrorist acts are being termed "man caused disasters," and class envy is encouraged through making the wealthy scapegoats, rather than the government admitting to its failures. Instead of the values once held by America, many young people now think America is somehow evil in spite of all the wonderful achievements of the generations who came before us. The inventions, the medical accomplishments, the help given to third world nations, are all overlooked and our positive history is seldom taught any longer. An Afterword in this book was written by Erich Fromm, copyrighted in 1961. He couldn't see ahead to the dangers of Socialism, but warned against individuals acting like machines and losing their humanity. We must always question our leadership and remain truly human, which means caring for one another and valuing life at all stages, from conception to an elderly death. Let's not allow our government or anyone else to inflict "doublethink" on us.